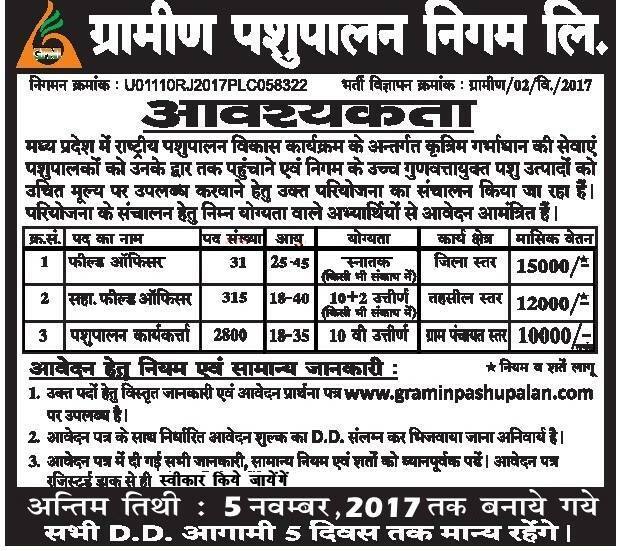 Gramin Pashupalan Nigam Limited Recruitment 2017| GPNL Recruitment Notification 2017| Apply online for 3146 GPNL filed Officer and AHW Recruitment 2017. The latest employment notification for the post of 3146 GPNL AHW & Filed Officer Posts has been out for those candidates who completed their Graduation degree. Gramin Pashupalan Nigam Limited (GPNL) has recently announced the notification for 3146 Filed Officer and AHW (Animal Husbandry Worker) to invite all the interested & candidates. Eligible candidates may apply for the recruitment of GPNL AHW & Filed Officer vacancy before the last date of application submission i.e. 05/ Nov/ 2017. Read all the GPNL Recruitment 2017 details such as age limit, eligibility criteria, job location, application process & other qualifications etc before submitting an application for the AHW Filed Officer Jobs 2017. Educational Qualification: Applicant should have completed 10th, 12th and Bachelor Degree from recognized Institution or university. Selection of the candidate for GPNL Recruitment 2017 will be based on Written Test & Interview. To apply for GPNL AHW or Filed Officer vacancy, the eligible candidates may download their application form the official website www.graminpashupalan.com. Fill the application form & send it to the given address along with the relevant documents as mentioned in the GPNL advertisement before 05/ Nov/ 2017.